Using aliasing distortion in the formant frequency range, or “yah yah yah”, is a good way to put a little fun into your bass line. The technique can be summed up as a frequency rich waveform passing through a modulated low pass filter and into a low quality Resampler setting at about 2000 Hz. If you followed that then you can probably just skip the rest of the tutorial. The first step is getting your synth. 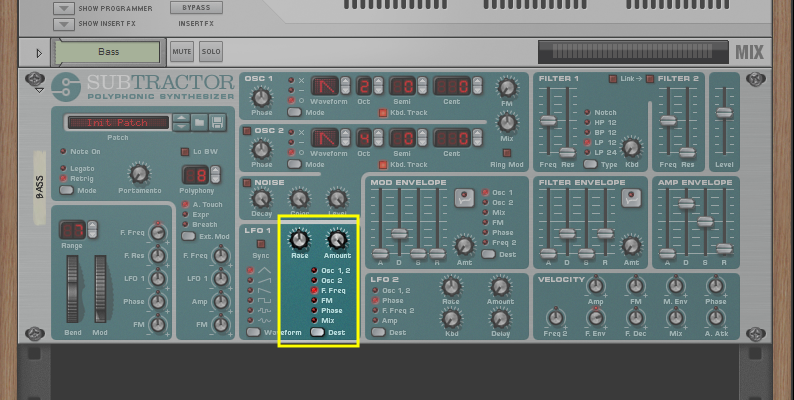 In this tutorial, we will use the classic Subtractor synthesizer. 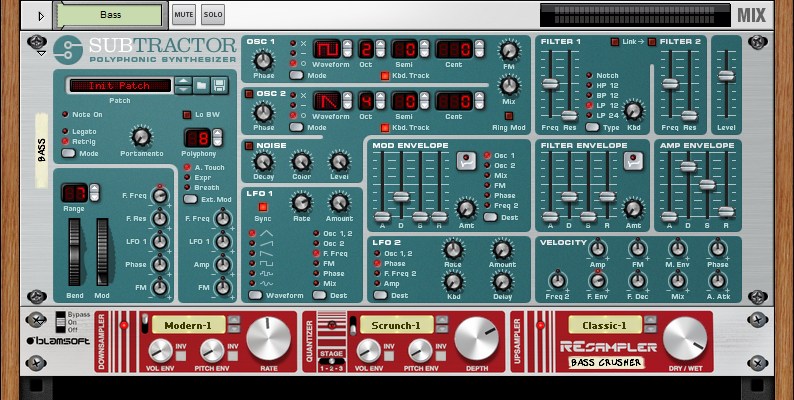 Create a subtractor synthesizer and use the right click menu to reset the device to its basic patch. Turn the octave of OSC 1 down to 2 to get a bass sound. Next we need to modulate the filter. This will be done using LFO 1. Change the LFO 1 destination (Dest) to filter 1 frequency (F. Freq). Turn up the LFO 1 amount and you will hear the modulation. Turn it up all the way for maximal effect. With the basic synth ready, we can add the Resampler. 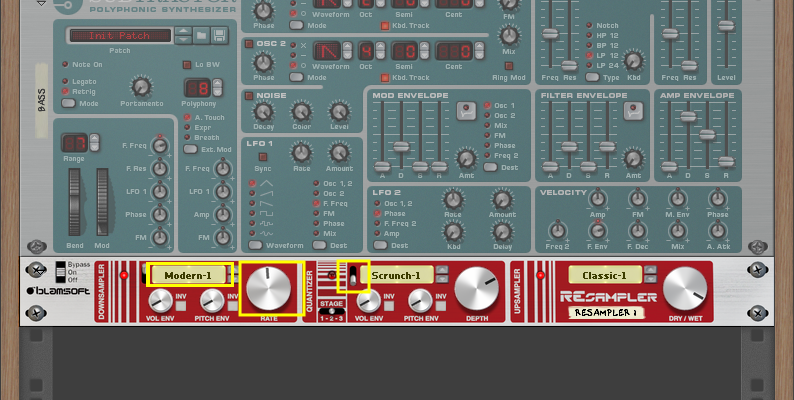 Add the Blamsoft Resampler, from the Creative Effects menu, as an effect on the Subtractor. Turn off the Quantizer by flipping its toggle switch down. Turn the Rate knob to 1910 Hz or so. Hold the shift key for more precise control. For a clearer sound, change the Downsampling algorithm to a low Modern setting. 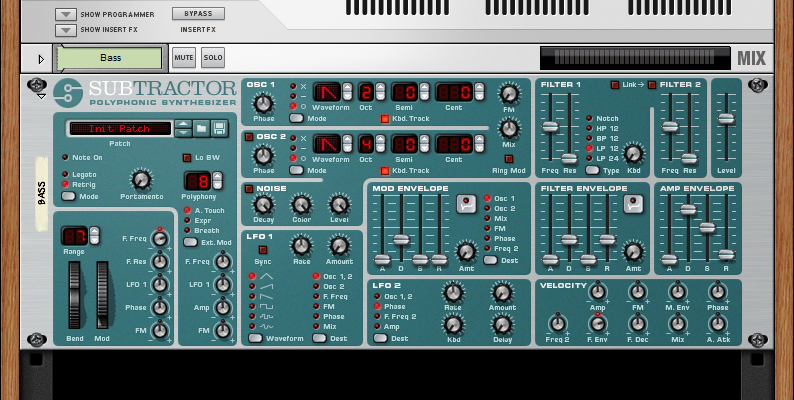 To finish off the sound, switch the Subtractor OSC 1 waveform to a square wave. Turn the Subtractor’s amp envelope sustain amount all the way up. And for playability, check the LFO 1 Sync box and experiment with the LFO 1 rate. The oscillator waveform as well as the downsampling and upsampling algorithms affect the sound. Low numbers are recommended for both Classic or Modern. Adding a little bit of Scream distortion also can add some spice to the patch. Thanks for reading, you’re invited to share your own enhancements in the comments section below. Something I noticed on talking basses, if you move the “Vol Env” knob around on the downsampler you can get different talking vowels.